The biggest running challenge event named '100 Days of Running' will live from 27th April 2, 2019 and ends on 4th August 2019. 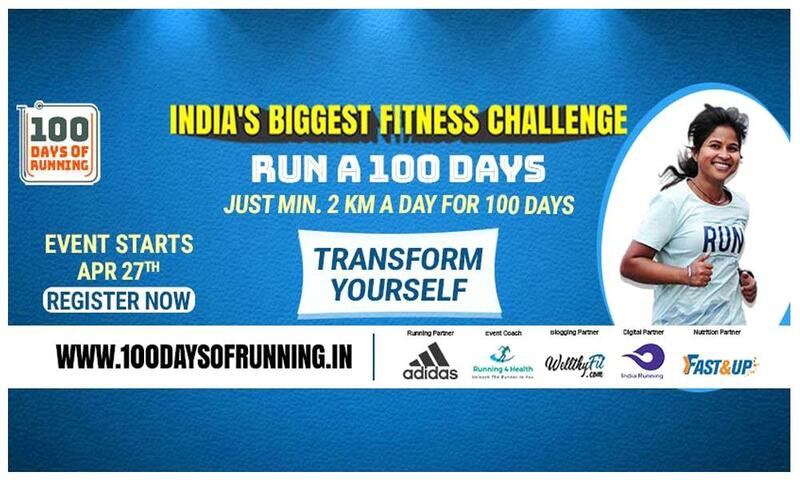 India’s biggest running challenge ‘100 Days of Running’ will starts on 27th April 2, 2019 and ends on 4th August 2019. This fitness event aims to make running a habit in our day today busy life schedule. This is not a competition event, which is only an event to make running as a habit or lifestyle. The previous 2018 edition was a great success, had participated 10,500 peoples. This 2019 edition is also trying to become a great success as previous. You need to complete 100 days and also need to run/walk minimum of 2km daily. You can walk or run as per your choice. Submit your daily running status of data submit page of https://100daysofrunning.in after logging in. You must submit your running status within 10 days otherwise you will not be able to enter data for those dates later.